[NEW!] Challenge your tastebuds with Mala fish from 江边城外! To be honest, I am not a huge fan of fishes - I do not know how to eat a fish without choking on their numerous bones. But, when I saw that 江边城外 (Riverside Grilled Fish) serves up "Mala" (麻辣) flavours using classic Chong Qing recipes, the #Spicybean personality took over and I said a silent prayer for my a-hole. "Please don't let me burn tonight..."
江边城外 is a popular chain of grilled fish restaurant in China that is no stranger to snaking long queues. Thankfully, they decided to open an outlet in Singapore. HOORAY! I like how they have decorated the place. The neat arrangement of "oil lamps" really makes you feel that you are sitting by a river. The flat noodles are made with quality soy beans sourced directly from Si Chuan, while the accompanying red sauce is homemade almost daily, according to the chef. One word for this dish? SHIOK. Refreshing and spicy, this is something that I would like 3 bowls of if I had a bigger belly. I wasn't really a fan of this dish as the duck felt really dry, and the flavours did not really come out for me. You can call it Pan-fried Shredded Pancake, or you can call it Prata. Either way, this was one of the crowd favourite that day because of its crispy, addictive texture. Also a perfect accompaniment to those sauces you are about to have from your main dish! Okay, this was not only delicious, but also damn spicy! Being a cold dish, it also helps to whet your appetite for all the spicy food. I was like "BRING IT ON, MALA FISH!" after I had this. We were served 3 of the signature flavours - Pickled Vegetable Sauce, Unique Sauce and Signature Fragrant Spicy Sauce, in ascending level of spiciness. The unique selling point of 江边城外 is that you can choose to pair your selected fish - Red Tilapia ($35), Sea Bass ($35), Black Promfret ($38) or Garoupa ($42) with any of their eight sauces. You can then choose from 18 different types of side dishes that you want to be cooked together with your whole grilled fish. These side dishes include sausages, pork belly, tofu sheets, flat vermicelli, luncheon meat, fish balls and many others. The Pickled Vegetable sauce is a good choice for those who do not have the capability to handle chilli. Yes, you did not read that wrong. They named this sauce the 怪味, which can mean strange taste in Chinese. Do not freak out if the waiters here suggest the 怪味 to you. The reason why the chef named this 怪味 is because you can actually experience four different kind of sensations when you have this - sweet, sour, spicy and mala. This sauce is for people who likes spicy food, but do not want to go to the extreme. Can we have some drum roll for the HIGHLIGHT? "LOOK AT THAT AMOUNT OF CHILI!" This is not for the faint hearted. 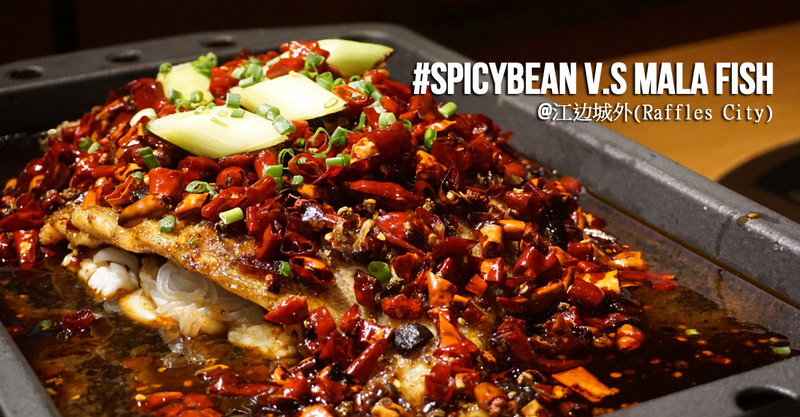 Made with ingredients like dried chilli, diced spring onions, sesame, yellow beans and peanuts, this is one hell of a challenge for #Spicybean. But alas, #Spicybean came and conquered this dish. The spiciness is definitely challenging for average chilli eaters, but seasoned chilli lovers would find this manageable. THIS WAS SO GOOD. Good like, people actually clapped when we were served a second portion of this Pan-fried Rice Cake with Soya Powder. The rice cakes are actually pan-fried with eggs, giving them that thin, crispy texture on the outside. Sprinkled generously with the fragrant soya powder, all I could feel when I bit into the chewy, mochi-like texture was pure bliss. This was like Muah Chee for the gods. A MUST-ORDER when you are here! I tried to make it swim. This dish is said to help you "calm your palettes" from all the flavours of the main dishes. I thought that the texture of this rice cake fish was a bit too "nua" (soft) for my liking, although the gula melaka sauce was pretty good. Overall, the restaurant serves a pretty challenging Mala fish that might pose a problem to even seasoned chili lovers. If you fear no death, you are always welcomed to make a trip down to 江边城外. #Spicybean wishes you good luck in your conquest! Related post: My new favourite late night haunt with awesome bar grubs. Guess where? This was a hosted tasting. Thank you Touch PR and Events for the invite!